Fionnira is the Champion of the goddess Shanimal, and the founder of the guild Harbingers of the Primordial Dusk. Fionnira was born to average farmers in an average village, but she herself was anything but average. From a very early age she showed great potential in the ways of Darkness; so much so, that when the Harbingers of the Primordial Dusk, a cult which was rising to infamy and power in the area, destroyed her village and her family, they decided to take the six-year-old Fionnira in to raise her in their image. Through her upbringing and training with the cult, she grew significantly in her physical, mental, and spiritual prowess, yet she grew evermore suspicious about her origins and parentage, as she was starting to see through the story the elder cult members had told her, which was that she was rescued when fire caught in her village. Upon her 17th birthday, the Supreme Council of the Harbingers decided to give her the truth she sought, believing she would take the news graciously and with tact. However, Fionnira became enraged, and late that evening, she fled the Harbingers' sanctuary, vowing to return to exact her revenge on those who stole her childhood. A few days after Fionnira turned 18, she returned to the cult sanctuary by night, intending to end the Harbingers of the Primordial Dusk for what they had done to her, and who knows how many other innocent children and their families. She murdered all of the elders and adults in their sleep, and upon reaching the trainee dormitory, she hesitated, considered letting them free as they were victims, just like as she was, but upon realizing most, if not all, had no family to return to, killed them in an act of mercy. As she pulled her blade away from the throat of the last one, she collapsed into unconsciousness. In her unconscious state, Fionnira had a vision. The goddess Shanimal appeared to her, who told her she was pleased with what she had done, and should she choose to worship her and become her Champion, she would provide guidance and healing. 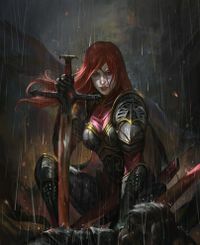 Fionnira, not knowing what she was to do now that her revenge had been exacted, accepted, and began her journey as a Heroine. When a little over a month of questing and adventuring had passed, she received divine instructions from Shanimal to recreate the Harbingers of the Primordial Dusk. Fionnira was hesitant, but accepted upon realizing she could recreate their teachings, which she truly did believe in, but without the corruption of power the original Harbingers had blatantly flaunted. And thus, on the Second of January, 2018, she set out on her quest to create the guild. This page was last edited on 5 January 2019, at 01:18.